Laura is the current EVE University CEO. She lives in the UK. 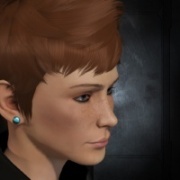 Laura joined EVE online on 1st January 2012. On 3rd March 2012 Laura joined EVE University for the first time. She obtained a mentor, attended several classes and fleets and briefly joined the Low Sec Campus. When EVE University fell under a war declaration she opted to leave the corporation for the duration of the war. However, that war never really ended. On 20th August 2012 she returned to EVE University and resolved that she would make something more of her second chance in EVE University. She volunteered as a Personnel Officer and a Student Advisor, joined several campuses, and started to get more involved in EVE University life, before devoting her time to the Personnel department. She now has clones in most campuses. Laura became a Personnel Officer on 28th October 2012 and got stuck right in to processing applications and performing interviews. She was fortunate enough to make lots of very good friends in the Personnel Department, and on 1st December 2012 was promoted to Senior Personnel Officer. When the Student Guidance Department was set up Laura also volunteered as one of the first group of Student Advisors, helping to direct EVE University students around to the various programmes and campuses that EVE University offers, as well as having stern words over silly killboard losses. On 28th April 2013 Laura became an Assistant Personnel Manager to Rose Chanlin. When she became an Assistant Personnel Manager she decided to step down from her duties as Student Advisor, because she didn't feel she could contribute the required attention to the role. Laura spent some time as a teacher, teaching various classes on basic subjects, particularly 'Introduction to EVE University' and 'Making a Difference in EVE University'. On 6th October 2014 Laura became Personnel Manager when Rose moved on to another role. She established the Orientation Department and served as the first Orientation Officer. Laura was promoted to the newly-created position of Personnel Director on 16th January 2015. She was then promoted to Director of Human Resources on 19th April 2016, which involved overseeing the running of the Personnel department but also the Titles and Mentor departments. On 27th May 2016 Laura became Director of Operations to Azmodeus Valar. Laura became a mentor on 7th July 2016 and served as a mentor until early 2017, mentoring three people in total: Howie Ernaga, Galifreid Skord and Sylvanas Shockstorm. Laura became CEO on 14th March 2017 when Azmo stepped down. Mining ledger - add to Mining page? More on Access lists on Citadels page - pictures? This page was last modified on 10 December 2017, at 11:56.